Leicester moved seven points clear at the top of the Premier League with six games remaining after Wes Morgan's header saw off Southampton. The Foxes skipper connected with Christian Fuchs' first-half cross to score his first goal of the season. Southampton came closest when Sadio Mane rounded Kasper Schmeichel, but his goalbound shot was superbly blocked by Danny Simpson. Leicester will win the title if they win four of their remaining games. Claudio Ranieri's side have now won five of their last six matches by a 1-0 scoreline, and after main title rivals Tottenham slipped up with a draw at Liverpool on Saturday, the most unlikely title triumph in Premier League history must surely be considered a probability now. Southampton remain seventh after a first defeat in four matches. Analysis: Why are Leicester so hard to beat? Only two of the Foxes' first 26 league games were 1-0 wins, but at a crucial stage of the season, they have found the knack of grinding out narrow victories based on defensive solidity and clinical finishing. They have also been able to rely on finding vital goals from unlikely sources - with Danny Drinkwater, Andy King and Leonardo Ulloa all having chipped in in recent weeks - and this time it was Morgan who found the net. The defender outmuscled Jordy Clasie from a cross by Fuchs - the Austrian's fourth assist of the season. Thereafter the hosts had to weather persistent Southampton pressure, as their possession dropped from 52.5% in the first half to 40% after the interval. But once again their back four proved impregnable, with Morgan and Robert Huth making 20 clearances between them. Southampton slipped to only a second defeat in six away games, but manager Ronald Koeman felt his side were on the receiving end of two bad decisions. The Dutchman alleged Simpson's first-half block was a handball, and cited a similar infringement in the second half when Huth blocked a cross. "For the third match in a row we don't get a 100% penalty - Stoke City away, Liverpool at home, and today two penalties," Koeman said. "The big one is when Sadio Mane's shot hits Danny Simpson and it is a red card and a penalty. If it is not a handball, it is a goal. I don't know what they are doing. "The second one was when Robert Huth handled. I don't say [Leicester] don't deserve the victory, but if it is a penalty and a red card, they don't win." Leicester captain Wes Morgan: "We saw the Tottenham game yesterday [Saturday] was a draw and wanted to make the most of our opportunity. We really wanted it today. "I've been getting a lot of stick because I haven't scored all season so it's great to shut them up." Eighteen of Leicester's 20 Premier League wins this season have come despite having a lower share of possession (it was 46.4% v Southampton). Leicester have scored in a league-high 29 Premier League games this season (three more than Spurs and West Ham). Leicester have made a league-low 25 changes to their starting line-ups overall this season in the Premier League, while only Manchester City (83) have made more than Southampton (81). Leicester are the first team to register four 1-0s in a row in the top flight since Liverpool in May-September 2013. Leicester visit Sunderland on Sunday, while Southampton host Newcastle on Saturday. Match ends, Leicester City 1, Southampton 0. Second Half ends, Leicester City 1, Southampton 0. Corner, Leicester City. 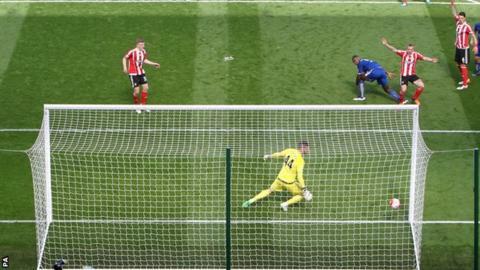 Conceded by James Ward-Prowse. Substitution, Leicester City. Nathan Dyer replaces Marc Albrighton. Christian Fuchs (Leicester City) is shown the yellow card. Attempt saved. Jamie Vardy (Leicester City) right footed shot from a difficult angle on the right is saved in the centre of the goal. Assisted by Marc Albrighton with a through ball. Attempt blocked. Wes Morgan (Leicester City) right footed shot from the centre of the box is blocked. Assisted by Demarai Gray with a cross. Corner, Leicester City. Conceded by Virgil van Dijk. Attempt missed. Daniel Drinkwater (Leicester City) left footed shot from outside the box misses to the left. Assisted by Jamie Vardy. Attempt missed. Sadio Mané (Southampton) left footed shot from the right side of the box is high and wide to the left. Assisted by Dusan Tadic. Attempt saved. Riyad Mahrez (Leicester City) left footed shot from outside the box is saved in the bottom left corner. Attempt blocked. Robert Huth (Leicester City) header from the centre of the box is blocked. Assisted by Marc Albrighton with a cross. Dusan Tadic (Southampton) is shown the yellow card. Corner, Southampton. Conceded by Robert Huth. Attempt blocked. Charlie Austin (Southampton) right footed shot from a difficult angle on the right is blocked. Assisted by Dusan Tadic with a cross. Substitution, Southampton. Charlie Austin replaces Jordy Clasie. Attempt saved. Danny Simpson (Leicester City) right footed shot from the right side of the six yard box is saved in the centre of the goal. Assisted by Jamie Vardy. Attempt missed. Ryan Bertrand (Southampton) left footed shot from the left side of the box is close, but misses to the left. Assisted by Jordy Clasie. Corner, Leicester City. Conceded by Jose Fonte.